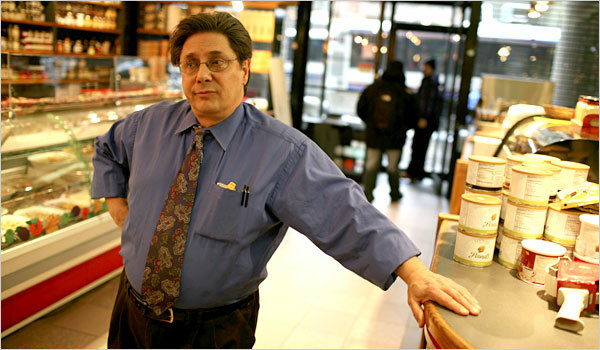 PETER Semetis, owner of Sale & Pepe Fine Foods in Lower Manhattan, was only recently paid for an event he catered in mid-December. IT WAS just $2,492.63, a pittance, really, alongside million-dollar television buys and direct mail drops. But with Senator Hillary Rodham Clinton’s bid for the Democratic presidential nomination enduring a rough patch, Peter Semetis, the owner of a deli and catering business in Lower Manhattan, had been following the news and growing increasingly worried that he was not going to be paid for the assorted breakfast trays, coffee, tea and orange juice he had provided the campaign for an event in mid-December. “I’m afraid of her dropping out of the campaign and me becoming a casualty,” Mr. Semetis said. So on Thursday, he went to small claims court and filed suit. Mr. Semetis, 53, said he was hardly a political pundit but like others across the country, he had become caught up in the election in the last year and was able to offer some analysis. Mr. Semetis catered a Clinton event, a rally she did not attend, at the offices of District Council 37, the public employees’ union, on Dec. 15, charging the campaign $2,300, plus $192.63 in tax. Officials promised him that his business, Sale & Pepe Fine Foods, would be paid by check or credit card in a couple of weeks. After a few weeks passed, he started calling to see about the holdup. Often he never reached anyone; other times he was told that his bill had been put through to the campaign’s headquarters in northern Virginia. Unbeknownst to Mr. Semetis, Mrs. Clinton was navigating some dire financial straits. She was having a dismal month of fund-raising while spending a million dollars a day to battle Senator Barack Obama. She finished January essentially in the red, with $7.6 million in debts, and she was forced to lend her campaign $5 million. It was when news broke about Mrs. Clinton’s loan earlier this month that Mr. Semetis became positively alarmed and started calling the campaign almost every day. “The fact she’s lost 10 states in a row has increased the phone calls,” he said. After a reporter from The New York Times contacted the Clinton campaign on Friday, Howard Wolfson, Mrs. Clinton’s communications director, said a check to pay Mr. Semetis had been put through the day before, and he furnished a copy of the check, dated Feb. 21, as proof. Mr. Semetis, however, is not the only one who has been having trouble lately collecting money from the Clinton campaign. The Hotel Ottumwa, a family-owned hotel in Ottumwa, Iowa, played host to an event attended by former President Bill Clinton on New Year’s Eve for several hundred people and had been trying for almost a month and a half to get paid. The hotel had initially asked for payment of the $9,125 bill up front but kept being put off. But the owners figured that if any political campaign was good for it, Mrs. Clinton’s would be. “People were a little more comfortable with Clinton because they’ve got money,” said Kay Whittington, one of the hotel owners. Last week, the owners heard about an item on the local news about a Des Moines cleaning company, Top Job Services Cleaning, which had been trying unsuccessfully to recoup $7,500 from the Clinton campaign. Hotel Ottumwa’s owners contacted the television station, which broadcast the hotel’s story right away. Both businesses were paid last week. Oddly enough, Mr. Semetis, the deli owner, said he was a longtime Republican who was supportive of Mrs. Clinton, because he believed Mr. Obama was too inexperienced and Senator John McCain, the presumptive Republican nominee, would be too much like President Bush. Mr. Semetis’s business closed for several weeks after the Sept. 11, 2001, terrorist attacks, forcing him to downsize, and Mr. Semetis said he was still trying to regain his footing.